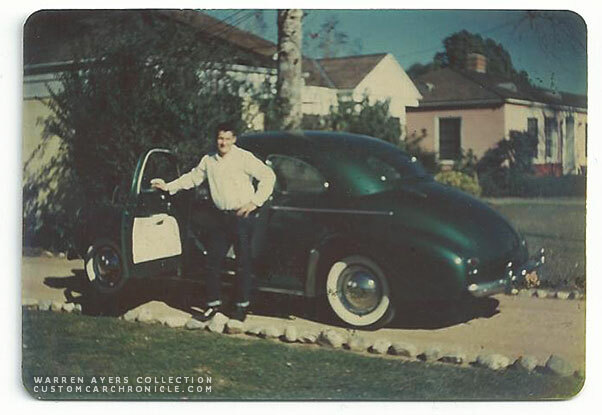 Warren Ayers bought a second hand 1941 Chevy in 1953, and was able to turn it into a wonderful mild Custom with work done by George Barris and bill Gaylord on a grocery store box boy salary. CCC-Member Chris Sharman send me an email a little while ago about a nice mild custom 1941 Chevy restyled in the early 1950’s. He mentioned that the owner of the guy back in the 1950’s had mentioned that both the Barris and the Gaylor shop had worked on the car. And also that he had a few small photos to share. 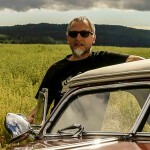 Well I’m always interested in any old Custom Car related stories, no matter what, they are always interesting to document, and share with the world to enjoy. Chris was going to meet the owner of the Chevy, Warren Ayers again, to ask him some more details about the Chevy. The small faded photos seen in this article is all that is left of the Chevy. 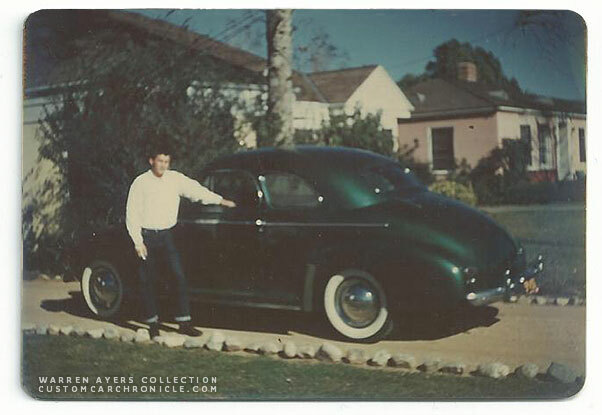 Warren Ayers posing proudly with his mildly restyled Tropical Green metallic 1941 Chevy parked in his driveway in Van Nuys California. 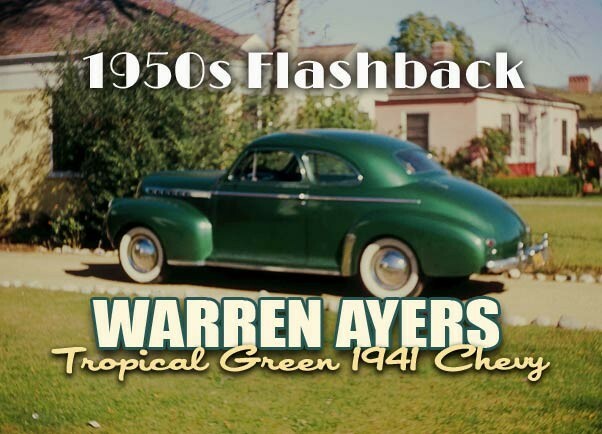 Warren purchased a cherry 1941 Chevy from his neighbors in Van Nuys, California in June 1953. He spent the next 2 years modifying and customizing and enjoying the car until he enlisted in the US Navy in 1955. At the time, Warren was working at a Grocery store as a box boy at Ralphs in Van Nuys. His father was able to help him out with things as the project progressed. Together they replaced the old Engine with a 1952 GMC six cylinder Engine. And when it was time to do some mild body restyling Warren took his Chevy to George Barris. The Barris Shop took care of the body work and the trunk handles, hood ornaments and some trim were removed and they slightly modified the tail lights. 26” glass packs with cut outs and pencil tips were installed by a shop called Magic Muffler and the car was fitted with moon hubcaps. The car was also lowered slightly by cutting the front springs and putting lowering blocks in the rear. In August of 1953 Warren and his father sanded the entire car down to bare metal and shot it with red oxide primer. After that it was shot with 2 coats of black Nason, color sanded, then shot with Kaiser Tropical Green (a 1953 Kaiser color) and finally coated with clear. Warren’s father worked at a Chevy dealership and they had the car painted there. Warren’s father in law (to be) had made aluminum side plates for the dash, to replace the plastic units on both sides of the radio as they were the station selection controls and volume control plates. Warren’s Wife (Girlfriend at the time) had made angora socks in green and white to hang from the rear view mirror to match the interior of the car. That was really the thing to have in your car back then. 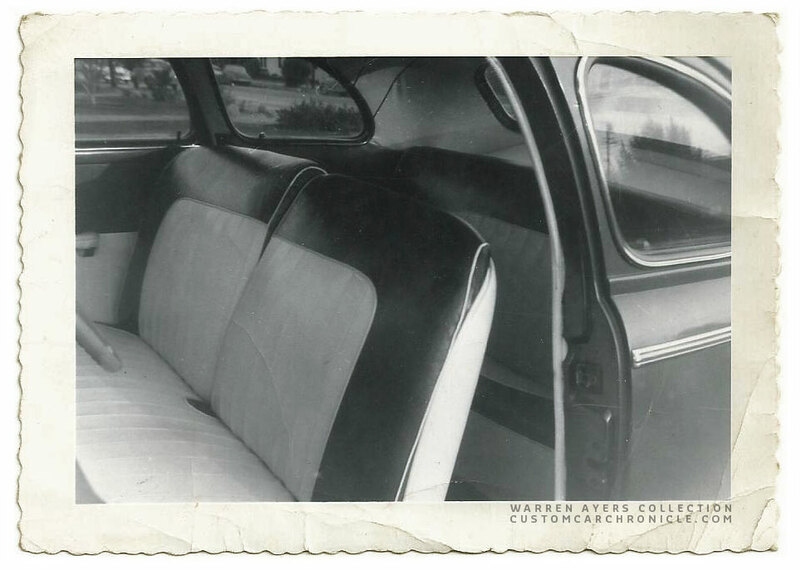 When it was time for a new interior Warren took the Chevy to Bill Gaylord, who did the upholstery using Warren’s design throughout, including the trunk compartment in white and green tuck and roll style. Tools mounted in the trunk were chrome plated by Faith Plating in North Hollywood, CA. I knew the guys son and he chromed a lot of stuff for us in those days for cheap! 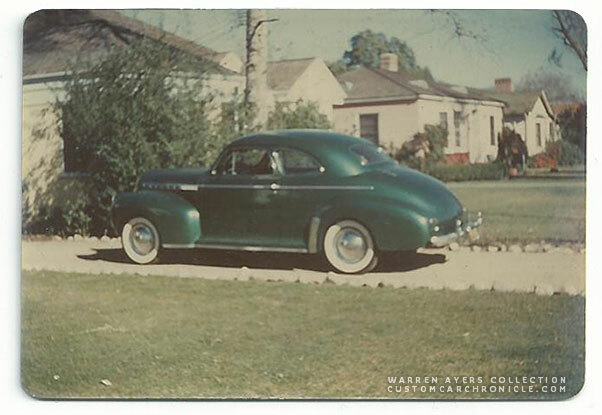 The interior in Warren’s 1941 Chevy was done by Bill Gaylord in white and green. When the Chevy was completely finished it was slated to be in an issue of Hot Rod magazine along with a White 1950 Mercury owned by a fellow named George Ono. However for one reason or another it never made it but there was a photo shoot done. Sadly Warren does not have any copies of the photos of this Hot Rod Magazine photo-shoot. When Warren enlisted in the Navy his Mother became the caretaker of the Chevy. She had some of the more performance orientated modifications reversed while Warren was away and eventually decided to sell the car. Its whereabouts or if it still exists today are unknown. One of the photos Warren had was of a bit better quality than the rest. 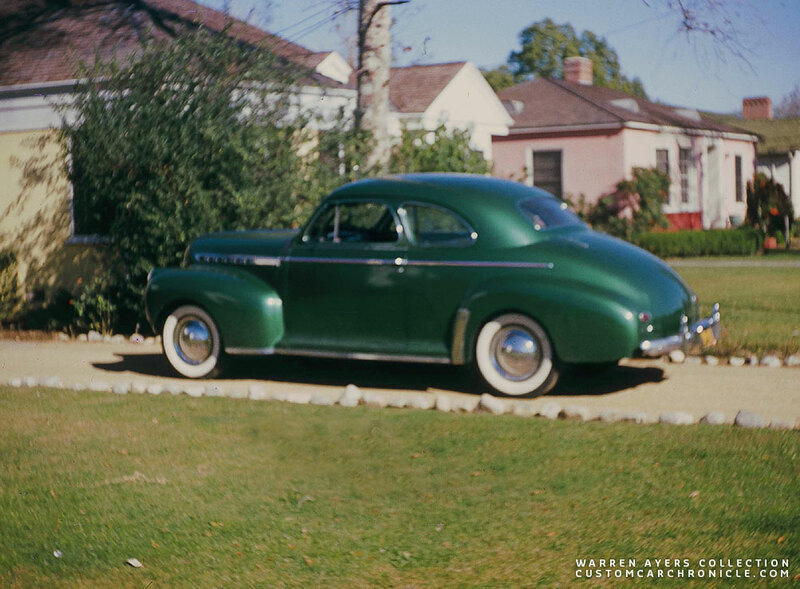 Although a bit fuzzy is gives us a nice look at this nicely done mild Custom Chevy parked in wonderful 1950’s Van Nuys, California. Warren’s 1941 Chevrolet is a nice example of a typical guy building a custom in the early 50’s on a grocery store salary. There were so many like this out there at the time. Wonderful mild Custom Cars that never made the magazine. Young guys, and girls who drove these cars all year around as every day transportation. Its great to hear stories like this, and see snapshot from back then to go with the story. 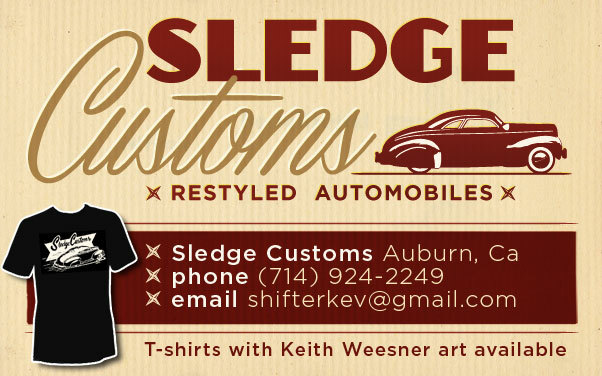 If you know about any of these personal Custom Car related stories, please let us know. We love to share them with the Custom Car Enthusiast from around the world. Thank you Warren Ayers for telling the story, and thank you Chris Sharman for sharing the story and photos with us here on the CCC. thanks memo! the 41 chevy i believe ? was the 1st year to have the headlights molded into the front fender from chevrolet, not outside. if i had the extra $$ or hit the lottery? i would hunt that car down and buy it back! Wishful Thinking!